Made of resin, this frame will accept a vertical 4 X 6 picture. The overall frame is 9" wide and 9 1/2" tall. 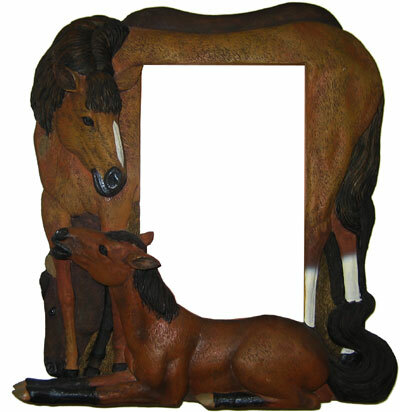 It depicts a mare and foal, but if you look carefully, you will also see the dark bay stallion in the background. This frame has provisions for standing on a table or for hanging on a wall.